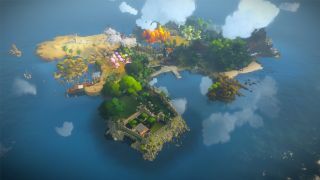 The Witness, by Braid creator Jonathan Blow, was one of, if not the best, puzzle games of last year. Now, almost twelve months on, the game has finally made its way to Android as an Nvidia Shield exclusive. The news might come as a disappointment for mobile gaming fans, given that the game’s slow-paced nature would be a perfect fit for on-the-go play, but given that an iOS version is still on the cards, we’d be surprised if the game didn’t make its way to the wider Android platform eventually. The Android operating system is increasingly turning into a platform for big-budget AAA games in addition to the mobile-focussed titles that have dominated the OS in the past. The platform has seen the likes of Rome: Total War, The Walking Dead (Season 2), Knights of the Old Republic, Bioshock and Half Life 2, which are all games that were major game releases when they first arrived. Granted, none of these are recent games (the newest being The Walking Dead which was originally released on PC and consoles in 2013), but with The Witness arriving just one year after its original release this could mean developers are making the platform more of a priority. Check out our guide to the best Android games.